BBT-015 is a long-acting granulocyte colony-stimulating factor (G-CSF) analog created using site-specific PEGylation technology. 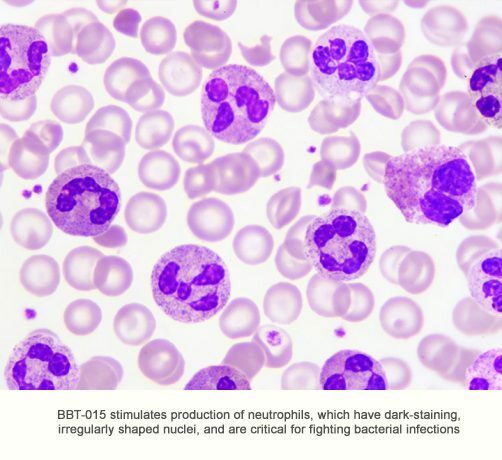 BBT-015 stimulates production of neutrophils, a type of white blood cell important for fighting bacterial infections. Annual worldwide sales of G-CSF products are ~ $6 billion, primarily for use of the proteins to treat chemotherapy-induced neutropenia (low numbers of neutrophils) in cancer patients. G-CSF typically is administered to cancer patients by daily subcutaneous injection, often for 16 to 23 consecutive days per chemotherapy treatment cycle. BBT-015 has a longer duration of action than G-CSF, and is expected to be administered only once per chemotherapy cycle (once every two to three weeks). BBT-015 stimulates faster neutrophil recovery than other G-CSF products in animal models of chemotherapy-induced neutropenia. BBT-015 also is being investigated as a treatment for Acute Radiation Syndrome, a BioDefense orphan disease market, due to the protein’s ability to accelerate blood cell recovery and increase survival following lethal radiation exposure.